We had a windy trip back to the Antigua Yacht Club where we docked at 1700. We had a few Engine issues to sort out so we were a bit latter than We wanted to be. We are now in a full clean up after the Southern trip and the Bucket. Some needed maintenance on Rosehearty, and a bit of time off for a few crew members. We should be laeving here on the 25th April for Panama and the Galapagos. The adventure continues! Rosehearty is the one in the middle…. with Hyperion to the right and our Friends on archimedes on the left..
We had a fair start but we sailed downwind really well. We managed to get around the bottom mark nice and clean. we sailed very well upwind and bore away and set all sail. down to the Barrel of Beef we went. At this point we simultaneously Dropped the spinnaker, gybed the boat and opend the jib. on a 190’ boat. Might have been our best ever.. Another spinnaker set and good Gybe and on ,finally to the last leg. This all set up for a thrilling finish and we kept sailing well all the way to the finish where we crossed ahead by a few minutes to be 1st home overall and 1st in class.. Another wonderful day on the water. Well done All Rosehearty crew. These are hard earned points.. 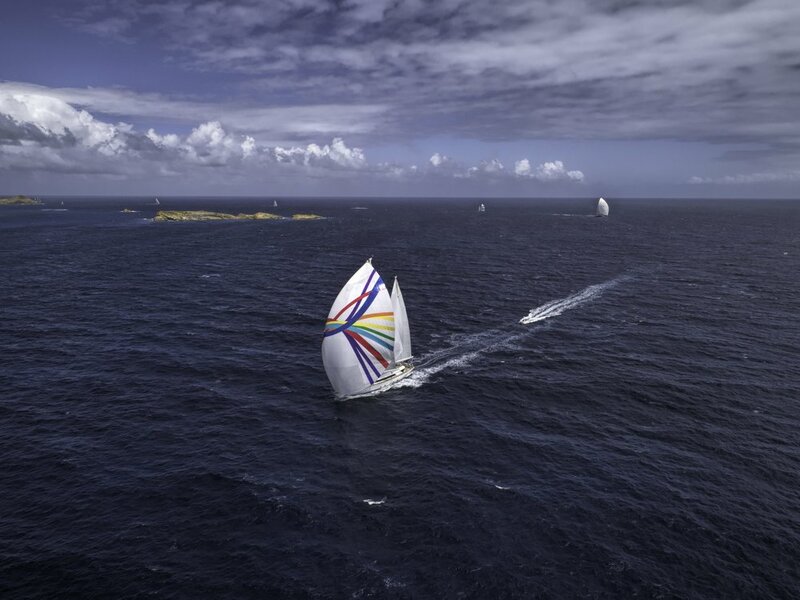 Here we are crossing the finish line..
Race 1 and a great start upwind.. We are off around the island Anti clockwise. We had a good 1st beat. After a long run down the back of the island we were doing well. We rounded Isle Fourche…The bottom mark and started upwind back to the finish. We had a few faster upwind boats catch and pass us and so at the end We ended up in 3rd..We should have maybe made second but upwind for us is never our best point of sail against single masted boats. So the 2 sloops overhauled us and were 1st and 2nd. All in all a great day sailing. Today we did a full practise downwind start. It is not easy to get correct and if We had done this as well in the racing we would have been quite Happy.. We practised the Wiggly Course always the most intense for the crew with 3 Hoists and 2 Spinnaker packs on the rail around the rocks we went as all the old Yellow stand off nature buoys have been removed. But another beautiful day on the water..
Well we had a great days sailing ..15 to 18 kts of wind. It was great to have the race crew back on board for the 4th conseutive year.. We sailed around the island and of course had a few issues as you would expect after so long a break from racing and so many miles. However we got around in due order. Looking forward to the week. Now We are In the process of final prep for the Bucket and our week of practicing. Now for 1 of those Cheeseburgers in Paradise! or maybe Burger palace! 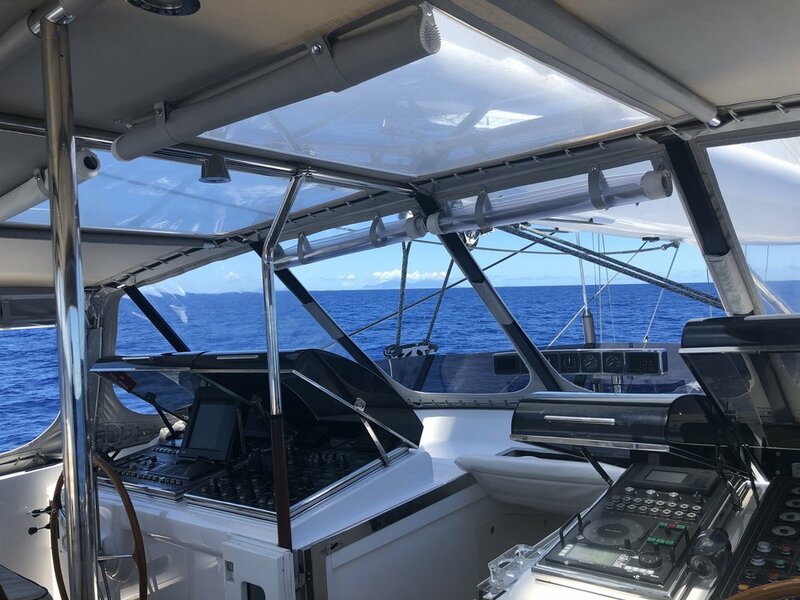 What a day to sail..35 mile visibility 15 knots of Wind, Sun and we are reaching..
We hopped out of Panama and Shelter Bay Marina and set off. Not too bad at 1st but as you get in towards the middle of the passage between Panama and Jamaica and Haiti the winds and sea are just relentless. 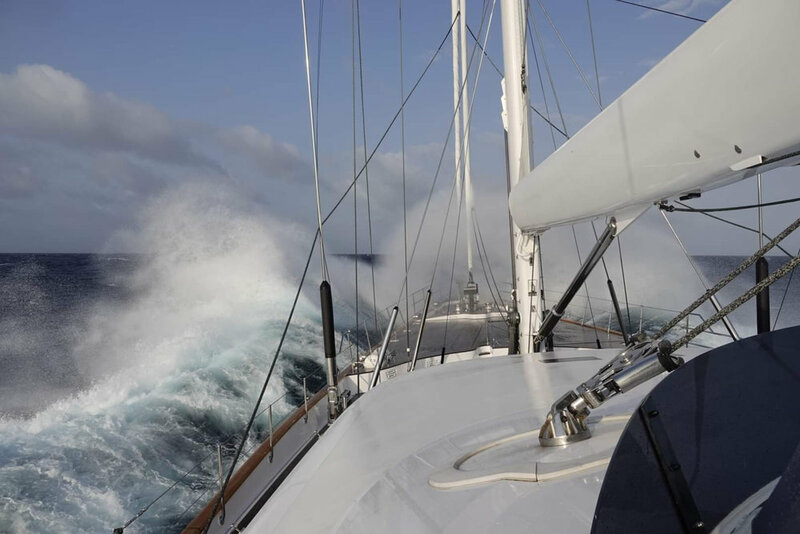 25-30 kts constant up wind gusts higher in a 3.5m sea with a period of 1 sea every 8 seconds. Speed is down around 6-7 kts and the going is slow and very uncomfortable. We have quite a few more days of this before we reach Antigua. hopefully early next week the conditions will moderate somewhat. Funny We always seem to go through at night..
A quick stop in Shelter Bay on the Atlantic side before braving the Easterly Trade winds in the Caribbean. always strong at this time of year.. It is always a marvel to come through the canal. Usually the experience is enhanced by the Pilot..However eventually you get someone who just does not understand the boat they are on. But Capt Markus and Brian got Rosehearty through safely even if the pilot was not sure of the bridge clearances at the tide height we were transiting and always better to be in the middle of the bridge span!. Clearance was about 3m but looks so much less. Now Out to the Caribbean. Not going to be as much fun for sure..
We arrived in to Valparaiso and said goodby to Magnus our Ice Pilot and the Marcello our Chilean Pilot. Also Hugo and Catherine got off on leave. Sad to see the team disperse. It has been some Journey. We welcomed on board however a few new faces to help get Rosehearty back to the Eastern Caribbean. Back with us Chef Artur.. Juggy and Nikki. A midnight refuel on the dock and We were off again. The photo does not do the town justice..
Well it took us weeks to get South in December and that was with the prevailing winds but Rosehearty has made it back North nice . As our Pilot puts it "is in the Open sea area" so it is a "Very good Idea" to get to Valparaiso as soon as possible as no one likes the "Open Sea Area"....Well we do! ETA To Valparaiso Tomorrow the 6th at 0800. Up next a crew change over and on to Panama! This ship ran aground on top of yet another vessel that had run aground. OH Dear What was going on. Story was supposed to be..The Captain had sold his cargo and was trying to wreck the ship. It is deep all around this rock and Wreck. But he miscalculated and planted it on the top of the rock and the previous wreck!. Where it remains 50 years later. Wonder what the insurance guy thought when he came on board…Captain where is the cargo! 20:30 - Rosehearty going through English Narrows. We dropped our guests in Williams and in Ushuaia. Just like that the trip was over…Years of planning. Done. We certainly got everything we hoped for and more and are left with fantastic memories of anther trip of a lifetime. Thank you Joey…..We switched out some crew, the lucky ones, and brought in our regular delivery guys to help us get North back through the Patagonian Canals..as we are on a tight time line we have added our Chilean Pilot Friend Marcello Sanchez. He allows us to use Canals that are forbidden to foreign flag vessels as the charts and GPS are un reliable and a strong local knowledge is required. So after some delay with beaurocracy back to Williams for fuel. And More Beurocracy…Finally from there it is full speed ahead for Valparaiso where hopefully the crew can get a few days to unwind before heading on to the Panama Canal..